What is the Proper Name for the Land Occupied by Israel, Jordan, and Other Nations in the Middle East? Did ancient writers call the land "Palestine?" The content on this page has been attacked by several visitors through comments and e-mail exchanges. I want to quickly say that I UNDERSTAND the political issues at stake - pro-Palestinian supporters are insisting that the land occupied by Israel should be called "Palestine" and they are using evidence from the ancient writers listed on this page to bolster their claims. I am NOT trying to give evidence for or against ANY modern-day political position - I am an historian of the Greco-Roman period. I am NOT responsible for those who would use my comments for modern-day political reasons. This comes from the Zola Levitt Web site and is written by a Thomas S. McCall, Th.D. Dr. McCall goes on to say, "It appears that Bible-believing Christians have either knowingly or unwittingly followed the world, pagans and haters of Israel in calling Israel by the anti-Israel term Palestine." Dr. McCall is correct when he states that the term "Palestine" does not appear in the New Testament, thus it is not a "biblical" term. It is, however, an "historical" term referring to the region that included Judea, Samaria, Galilee, [even Syria for some] and other smaller territories (ancient writers are cited below). This is true. I have not yet found the ancient document where this is referenced, but I do want to challenge the overall tone that "Palestine" was somehow never used until Hadrian and that using the term is equal to being a "hater" of Israel (I will be sending this response to Zola Levitt and to Dr. McCall). I keep receiving comments from this page restating what Dr. McCall's position is, which I have clearly and accurately reported. See one such exchange at the bottom of this page. Please do not send comments repeating what so many others have sent me. IF you can answer some of my objections I am happy to see/read historical evidence. If you can send me scholarship showing how the ancient writers' use of "Palestine" were tampered with, I will correct my mistake. Several ancient Greek writers use the term "Palestine," [Palaistinh, Palaistine] referring to the broad region which included Judea. Aristotle, Herodotus, Philo the Jew, and Plutarch all use this term. Philo is also interesting because he represents the Hellenized Jews - Greek Jews scattered around the Roman Empire, unable to worship according to the Laws of Moses. Philo lived in Alexandria, Egypt with around 1 million Jews, the largest Jewish population outside of Jerusalem. Notice that he refers to "Palestine" as a region that includes the Jews. It is important here to restate WHY I am writing this article: to show that there are ancient writers who refer to the general region that included Judea, Samaria, Syria and Galilee as "Palestine." In the Comments section below I will cite one more ancient writer, the Roman writer Strabo. Strabo also refers to "Palestine." I will also cite an Israeli historian who discusses Strabo and Josephus, agreeing with the data I have laid out. One of the more aggressive e-mail exchanges has been with Edwin. After giving me all of the same old, worn-out arguments I have heard over and over, Edwin finally challenged me, saying that he had "publicly discredited [me] on the internet." Then he wrote, "What you failed to state, willfully or neglectfully, is Aristotle, in fact, referred to the country of Judea as Judea. You're done." 1. Let me just say that NOWHERE did I say that Aristotle never referred to Judea. You are the only one misrepresenting here. I pointed out one text where Aristotle uses "Palestine" and is obviously referring to the land of Judea. I will edit my page to clearly state this, however, I never said that he used "Palestine" exclusively. Cohen correctly states that the term referred to "the land of the Philistines," but goes on to illustrate how ancient writers either did not know this or simply decided to use the term in their own way, referring to the broader region. This is yet another scholar using "Palestine" apparently to refer to the region that includes Judea and other nation-states. Who is it? Your former professor. Just do a search for "Shaye Cohen Aristotle Palestine" on Google books. One of McCall's points is that most maps used in Christian Bibles follow this inaccurate usage of "Palestine,"
Why not go back to the terms used in the New Testament? 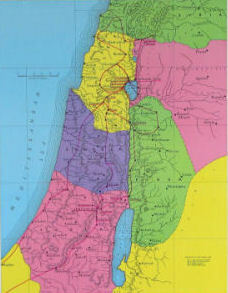 The Gospel writers used the term Israel to refer to the Land. Why should we use any other term when referring to the Land, especially now that the Jews are back in the Land and have re-established the nation of Israel among the family of nations? As I have already alluded to, the problem with this position is that "Palestine" includes many territories other than Israel. I am looking at Map 10 in my copy of The New Oxford Annotated Bible with The Apocrypha - this map includes Syria, Galilee, and Samaria. Map 11 is the same. Are we supposed to only have Israel on these maps, or are we to name the map "Israel during the time of Herod" and include these other territories, thus doing to Syria what McCall claims is being done to Israel? This, of course, is absurd. I learned during my time of doing research in the UK that the Brits (from Britannia, the Roman name for the territory that included what is now Scotland, or Caledonia) are typically far more historically accurate than most when it comes to the Graeco-Roman world. They were, after all, part of that empire. When the Oxford Bible uses "Palestine" I am confident that it derives more from an historical perspective than from a political one. I am more bothered by the assertion that "Bible-believing Christians have either knowingly or unwittingly followed the world, pagans and haters of Israel in calling Israel by the anti-Israel term Palestine." So I am now being lumped together with those who are following Israel hating because I refer to the land of Israel (along with the surrounding territories) as "Palestine?" This is offensive on many levels, but as an historian I am supposed to represent history as...well, history. I know there are those who misrepresent history to promote their particular social, political, or theological viewpoint, but it is not something a good scholar does. I hope and pray that I would not follow this methodology of poor scholarship. I am certainly NOT a hater of Israel. In fact, I probably agree with Zola Levitt's position most of the time. What I am is first, a Christian. Secondly, an historian. When I first read the content forwarded to me I had no idea where it had come from, except that it was a pro-Israel source. What I did know was that the source was not being objective enough to qualify as good scholarship. I would ask Dr. McCall to lay aside his pro-Israel position long enough to view this evidence from an historical perspective. Using the term "Palestine" to refer to the region in the ancient world that includes Israel is NOT Israel hating. It is the proper way to refer to an historical concept - the way it was used by the historical subjects being discussed. I have had a few visitors chastise me saying something like this, "You keep using these Greeks/Romans as your guide for how to refer to the land. You should use the term that the indigenous people [thus Israelis] use [and/or] use the biblical terms. 1. I am an historian of the Greco-Roman era, thus I must use the terms used by the ancient writers during the period being discussed. If I were writing as an historian of the Old Testament, or as an Israeli historian, it might be different. 2. The same point applies for trying to use ONLY biblical terms. I am not writing as a biblical historian. The biblical writers rarely refer to the region as a whole. It is similar to how the Chinese government wants to refer to Taiwan as part of China. Fine for the Chinese, but the Taiwanese have quite a different opinion. Those who want to refer to the region as "Judea" fail to appreciate that the other regions did NOT refer to their land as "Judea." 3. Historically, at the time of Jesus, this region included at least two other "nations," or distinct people-groups (Syria and Samaria) that did NOT refer to their land as "Judea." I have had several exchanges from visitors to this page. Each of these people continue to minimize the citations above by Aristotle, Philo, etc. and a few have even said that later translators changed the texts, adding "Palestine." In at least two of these exchanges I asked for scholarly evidence. I have not been able to get any of these guys to answer any of my specific positions - over and over again, each would simply restate the same stuff about the translators OR they would restate the Hadrian data (which I never disagreed with). Here is a compilation of 2-3 threads that began with "Comments" and continued in an e-mail exchange on this topic. The ancient writers you list (like Aristotle) are Greek writers, so their use of "Palestine" is dubious - it is fairly certain that the translators of these writers inserted the term "Palestine." "Palestine" was always the term used in relation to the Philistines, the people that lived on the coast and was an enemy of Israel. "Palestine" never existed as an independent entity. "Palestine" was part of the Egyptian kingdom under the Ptolemaic rule. Later "Palestine" was part of Syria and Phoenicia during the Seleucid kingdom. Yet throughout this history Judea was a separate and independent nation. The Greeks, under Alexander the Great, allowed Judah to remain independent until the time of Antiochus IV. It is interesting how many people like you e-mail these exact comments [In other words, "try thinking for yourself rather than copying from another web site"]. So here we have Luke speaking of Galileans, then mentioning Judea in a listing of nations/countries. Why would he do this? "Each of us hears them in our native language?" Why would he not say Judeans? Because Galilee was seen as a separate province from Judea? Galilee was separated from Judea by Samaria, another province. My question to you is this: was Samaria part of Judea in the first century geography? If yes, then why does Luke refer to them separately? If no, then it is obvious that Judea does not refer to the entire region which is why the term Palestine seems to have been used. Nov 18, 2015 - I just found yet another very good historian, who uses the term in his title: The Land Called Holy: Palestine in Christian History and Thought, (1992) Robert Louis Wilken. Yuval Shahar, "Josephus Geographicus: The Classical Context of Geography in Josephus." Shahar illustrates how Strabo and Josephus describe Palestine in three regions: the Lake of Gennesar, the valley of Jericho, and the Dead Sea. For those who would accuse me (or anyone else of "Israel hating," I would urge you to check out this Jewish scholar, Yuval Shahar, educated in Israel, yet he uses "Palestine" and reports that Strabo and Josephus used this term as well. Shahar never mentions the supposed insertion of the term "Palestine" by Greek translators - I am more convinced that this is an "old wives tale." I do not disagree with the name change that you are telling me happened later under Hadrian. But IF ancients writers prior to this time use the term "Palestine," which I THINK they do...then it is an historical term. Irrespective of whether Herodotus and Aristotle used "Palestine" or not, they were Europeans from another continent who were referring to Philistia, the limited southwestern coastal region of the land also referred to in the Hebrew Bible. [The citation I have used from Aristotle is talking about the Dead Sea. Thus, Aristotle is obviously NOT referring to Philistia - he IS clearly referring to Judea. This visitor consistently fails to address my fundamental question: IF Aristotle's Greek was changed by later translators, please point me to an academic source that will instruct me on this point. Al.B.] Incidentally, the Septuagint refers to Philistieim or Phylistines, not Palestine. And, as I stated earlier, "Palestine" was not recognized as a separate entity by the Seleucids and Ptolemies, who viewed the land as an integral part of the Egyptian Kingdom and of Syria. The correct historical geographic name of the land was Canaan/Judah/Israel, not Palestine a term non-existent in Hebrew, Arabic nor in any Semitic language. Nor, does Palestine exist in any ancient archaeological findings. The consensus among historians is the official change from Judah/Judea to Syria Palaestina was instituted by the Romans in retribution for the Bar Kokhba uprising, in an attempt to erase the histlorical Jewish connection with the land, renamed after the Philistines, the ancient enemies of the Israelites. "Palestine" is derived from the Hebrew Peleshet [Land of the Invaders/Philistines] which the Greeks changed to Palaistine and the Romans to Palaestina. I fully understand that this term was NOT used in Hebrew, nor in the LXX, nor in the NT. But the point that started my posting was someone attacking my usage of the term, stating (as you do) that the Romans changed the name after Bar Kochba. Fine. I do not disagree with this data, but I was pointed to an article that stated "Palestine" had NEVER been used until Hadrian and attacking me and every other historian [that uses the term "Palestine"] as "anti-Israel." My point is to show that the term WAS used prior to Hadrian as a way of referring to the REGION, of which Judea/Israel was included. Yes, these were "Europeans," but it is still historical data. You state, "The consensus among historians..."
I have now consulted with three modern experts of Philo and Josephus (one exchanged a few e-mails with me), all Jewish scholars. In my reading two of these scholars never mentioned this theory of editing "Palestine" into the Greek documents. The one scholar I exchanged e-mails with reports to me that she has never heard of this theory. I seriously doubt this theory and welcome anyone who can point me to credible scholarly work that would indicate otherwise. See statements, below. The use of the word "Palestine" is limited to a small handful of Greek writers or, more likely, their later translators. Herodotus was translated 1300 years later. However, as stated previously, those references to "Palaistine" were derived from the Philistines and the Hebrew Peleshet. Herodotus has been accused of never having visited the Near East and of having not been truthful in other matters. There is no evidence of which I'm aware of the Seleucids or Ptolemies using "Palestine" when it was under their sovereignty. The land was not separate from Syria. I have now said twice that my disagreement is NOT with the name change after Hadrian. I am willing to concede this point. What I asked for was historical evidence (by the way, these quotes you offered below are NOT citing primary source documents which is what a credible historian should do) that no ancient writer used the term prior to Hadrian. You keep attacking Herodotus. Fine. How about Aristotle and Philo? You say later translators changed the language. Point me to some evidence of this. Please stop telling me the same thing over and over as if to repeat something ad nauseam will make it true. I'm citing statements from eminent historians. No offense, but, you are not one. You seem rather obsessed with "Palestine" when historically the term is an obscure one. I am a formally trained historian and I know what credible historical research/writing is. For this particular data a citation from primary source material is called for. PLEASE DO NOT send comments repeating the SAME information.